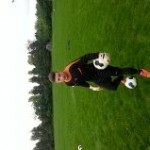 Another J4K Goalkeeper has scored a goal, this one must top the lot !!!!…. Super Keeper Carl Casey lined up a free kick whilst playing for Shamrock Rovers Under 15s in a DDSL Premier clash Vs Home Farm. Carl did not venture forward and try and take his strikers job !! !… Carl took the Free Kick from 15 yards in side his own half and watched the ball take one bonce and deceive his opposite number and find the back of the net from 70 yards out. Carl who is renowned for his ability to produce TOP CORNER saves showed his miss firing strike force how it should be done !!! !.